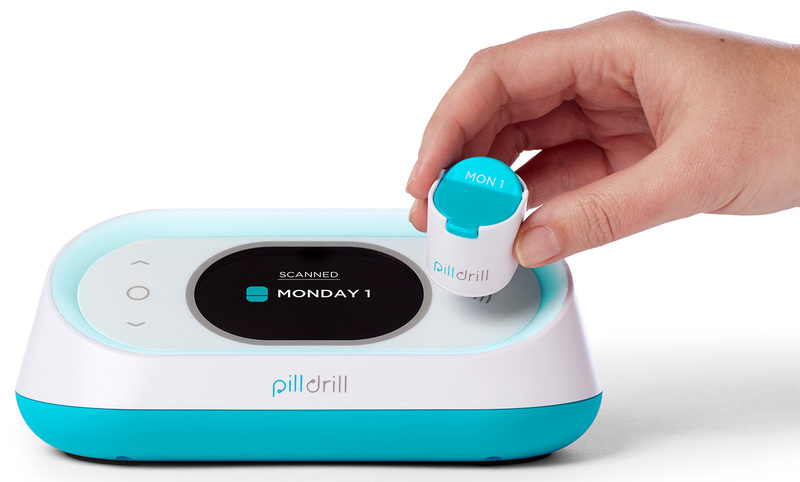 A smart, intuitive pill organizer that doesn't embarrass its patients. Folks who rely on medication for a long period may forget their routine once in a while, especially the elderly or anyone with memory loss. It also gets rather dull when every conversation with the family starts with, "Have you taken your pills yet?" This is where PillDrill comes in. The system consists of a hub that resembles a cute-looking alarm clock, a couple of weekly pill strips containing RFID pods (you can add more strips, too), a dozen alphabetical RFID tags for your own bottles, a "mood cube" and a mobile app. You don't need to learn how to program your schedule: Just take your pills the way you're used to -- be it with the pods on the pill strips or with the original pill bottles -- and scan their RFID tags onto the right hand side of the hub as you go along. After it's learned the pattern, the system will notify both the patient and family members or caretakers -- via the hub's flashing light and beeping sound and via the app or SMS -- should the patient fail to log his or her medication. This allows the patient to be monitored remotely rather than being nagged all the time. For those who are tech-savvy enough, you can also use the app or web form to manually schedule and label each medication, if you want to get things started right away. Afterwards, you can check the schedule either in the app or on the hub -- the arrow buttons on the left let you check previous and upcoming reminders. To make full use of the remote monitoring feature, the PillDrill's mood cube lets the patient log his or her feeling at any time. Just place one of the five faces -- "great," "good," "OK," "bad" and "awful" -- onto the RFID scanning area on the hub to log, and whoever has the app running will get a notification should something go wrong. On a related note, the notifications are highly customizable: You can set it so that you only receive notifications if the patient fails to take medication after a set period (say, two hours); and you can also set it so that when the patient is at home, the system only funnels notifications through the hub and skips the app, in case he or she finds the double alert too annoying. The idea of PillDrill came from Peter Havas, formerly of Specialty's Cafe & Bakery fame. During his time in the US some years ago, his mother was recovering from two hip surgeries back in his home town in Australia, and even though he was unable to take too much time off work, he was impressed by how he could use Fitbit to monitor his mother's recovery, which inspired him to develop a system that could do the same for monitoring medication intake. While there are similar systems on the market, many are clunky, difficult to use, and some even require a subscription fee. "Everyone had missed the mark." For Havas, his system should work with the patient's existing habit, and it should also look good. He went as far as reading all the reviews of existing pill strips to understand everyone's pain points -- some were hard to open and some were too easy to open. In the end, he ended up with a pill strip design with pods that can be easily secured onto the strip, and their lids can be opened with one hand (which is important for those suffering from arthritis) but are also tightly sealed when closed with a click -- as is the case with the prototype I saw in Hong Kong two weeks ago. Similarly, the scheduling system appears to be idiot proof and also quite handy for those monitoring remotely. It's apparently so good that none of the users in the beta program wanted to return their units (though Havas said he's actually going to swap them with the final version). The aforementioned PillDrill package is available now for $199 and will be shipping to North America towards the end of May. If all goes well, Havas' team may expand into other regions as well.